Tucked in a corner of my wallet, in the compartment that holds loose change, is a well-worn fava bean meant to bring good luck. Eighteen years ago, my grandmother carried this same lucky bean. But according to Judge Anthony Russo, founding member of the Italian American Marching Club, the luck ran out long ago. And the best place to get a new lucky bean is at the Italian American St. Joseph’s Day Parade. The parade is held in honor of St. Joseph, the patron saint of Sicily. 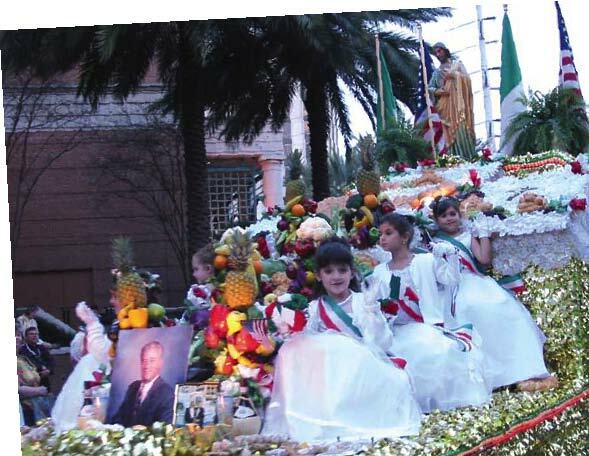 With 90 percent to 95 percent of Italian American citizens in the New Orleans area being of Sicilian descent, St. Joseph’s Day is cause for serious celebrating. Each year families create altars in their homes laden with symbolic foods and other items: cakes, cookies and cannolis, loaves of home-baked breads, traditional meats, fruits, vegetables and cheeses, flowers and candles. Anyone from New Orleans has surely seen the extravagant public altars erected around the city in churches, halls and restaurants. In 1970, Russo and a few friends founded the Italian American Marching Club. Prior to that, with only two days separating St. Patrick’s and St. Joseph’s days, the Italian American community had always participated in the Irish Channel St. Patrick’s Day Parade. In their first year, the IAMC followed the same route as the Irish Channel parade, but the second year, the group decided to “leave the Irish Channel for the Irish” and move its parade route to the French Quarter, which historically had been home to many Sicilian immigrants. Held on the Saturday prior to St. Joseph’s Day, floats are strung with lights, decorated with Italian and American flags, and adorned with red, white and green bunting (the colors of the Italian flag). One float is decorated as a St. Joseph altar with all the traditional food items (which are donated to a charitable organization following the parade) and a title float displays the IAMC logo. The remaining floats carry 100 maids (dressed in long white gowns, with tricolored sashes, and carrying little bouquets of red, white and green carnations) and the court. 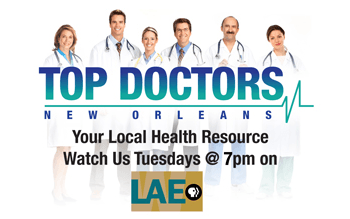 This year’s grand marshal is one-time teen idol Frankie Avalon; the caesar is Dr. William Lacorte; the queen is LSU freshman Victoria Gilberti; and parade marshals (former grand marshals) are actors James Darren and Vincent Pastore of Sopranos fame. Then there’s the Godfather’s Legion with “godfathers” riding along in sleek black convertibles. For members, the festivities kick off with a grand dinner the night before. “This is Vincent Pastore’s third year. He just loves the parade, loves the city of New Orleans. And when we get him to start eating food … that’s the real reason … I’m sure he loves us, but he loves the food better.” The day of the parade begins with a pasta party complete with Italian music, wine and presentation of the court. Immediately following the parade is the gala or Muffulatta Dance held at the Hilton during which the maids are presented by their fathers and grandfathers, and guess what? Muffuletta’s are served. But the highlight is really the four-hour-long St. Joseph’s Day Parade—the part that nonmembers can and do participate in. 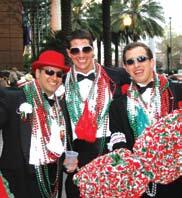 In New Orleans any event is reason to parade, but preservation of Italian American heritage is really the root of the IAMC. “We go through a lot of effort not to make it look like a Mardi Gras parade,” says Russo. All the favors have an Italian American theme and are in the Italian American colors. And of course there’s the ever-popular lucky fava bean, which is really extra special. “Prior to the parade, the priest blesses the altar float and all of our lucky beans,” says Russo. 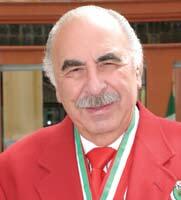 Saturday, March 14, 6 p.m.
To learn more about the Italian American Marching Club, visit www.italianamericanmarchingclub.org.